Accounting is the foundation of any business, but for a small business owner, trying to manage your finances on your own can be a challenge. You may think you're saving money but the time spent on accounting and bookkeeping tasks keeps you from bringing in revenue, and hiring an in-house bookkeeper will only consume more of your resources. The best solution is to turn to Rand CPA's for outsourced bookkeeping and accounting services. We're a local Reno, NV CPA firm that works with all types of small and midsized businesses. What if your accounting department looked like this? At any time, day or night, and from any location - work, home, or out and about - you log on to your accounting reports using your secure password. You find your books complete and up-to-date, including yesterday’s activity. You check your daily sales, your month-to date, your year-to-date, including a comparison with last year’s results. Your accounts payable and accounts receivable are accurate and up-to-date. It’s all there. No excuses. No waiting. You access a dashboard which shows you your daily key performance indicators and tells you how you are progressing toward your monthly and quarterly benchmarks. And, best of all. You and your staff have not had to make a single entry. It’s all done for you, and it’s always up-to-date. 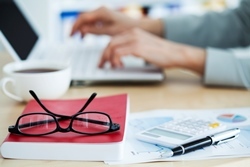 "Is outsourcing my accounting tasks really possible?" Yes! We do it every day. We set it all up and run it for you. The next-day bookkeeping, the overnight paperless file, and document system. We harnessed the latest technologies and developed the systems that make all this possible. No longer do you need to rely on cumbersome filing systems or delayed end-of-the-month bank reconciliations. It is now possible to have virtual, same day bank account reconciliation and electronic filing and delivery systems. We use these systems and several more, all synchronized together, to deliver an eye-popping service that promises speed and accuracy, along with ease of use and access. Rand CPA's's Total Outsourced Solutions leaves yesterday’s bookkeeping and document systems and procedures at the starting line. The largest of companies already use similar systems, but they have huge sophisticated accounting departments and internal paperless systems with on-sight network servers to make it all happen. Now, we make it happen for companies of all sizes by using a combination of all of our “best practices” systems along with our tested setup procedures and extensive experience. Don't waste another day struggling to keep up with your finances. Gain access to the knowledge and skills of an experienced financial professional by calling Rand CPA's at 775-525-5291 today. You can also request a consultation online.